A year has passed, but the message at the 12th annual Real Estate Forecast on Wednesday night was almost identical to 2011: Its a buyers market out there. And just like last year, brokers are saying the best values wont be around much longer. Two-thousand-and-tweleve might be the last year for getting the best deal, said John Wells, a broker with the Wells Group. Bob Allen, owner of Allen & Associates  a real estate appraisal, consultant and research firm, presented 104 slides of data on property prices, sales trends and demographic statistics that affect La Plata Countys real estate market. The data showed the number of transactions and total dollar volume of sales in the county slowly bouncing back from their lowest points in 2009. 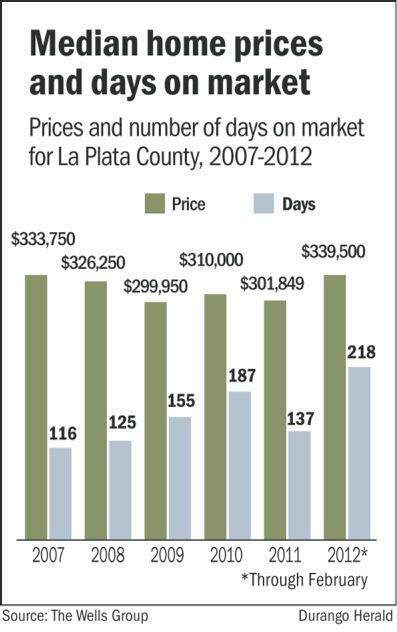 The number of transactions in La Plata County climbed from 950 in 2009 to more than 1,100 in 2011. Were starting to see signs of a bottom, Allen said. But its important to remember that it is all so very slow compared to what it was, he said. Many of the measures Allen presented, from building permits to property prices to transaction numbers were well below peak levels in the mid-2000s. Even so, positive job growth, low sale prices and low interest rates are good news for buyers and brokers, Allen said. A steady rise in the number of households in the county coupled with minimal new building projects in recent years also have positive influences on the market, Wells said. Demand is starting to balance out and even outweigh supply in Durango, Allen said. Prices have yet to reflect that trend: median home prices in the city crept up only a few thousand dollars since last year, hovering around $350,000. The more rural parts of the county have yet to see demand come close to supply, however, causing predictions that prices in those areas may fall even more, broker Joe Bob McGuire said. Homes in the Durango Mountain Resort area sold for an average of 16 percent less than their listed price last year, compared with homes sold in Durango, which sold for only 4 percent less than they were listed. Homes between $200,000 and $400,000 are the most in-demand, but brokers also have seen a firming up of the $500,000 to $700,000 market over the last year, Wells Group broker Rick Lorenz said. Meanwhile, the supply of homes priced above $1 million has fallen from 10 years to four years since 2009. Foreclosures, though declining, will continue to affect the market and home prices, Allen said. On the buyers side, investors and second-home buyers are returning to the market, but not at the levels seen in 2005, Lorenz said. Among people who are buying homes as an investment, many are doing so because other investment options arent generating much return, said Christine Serwe, a broker with the Wells Group. Data show the profile of buyers coming from other states has changed since 2005. The number of buyers from California has dwindled, while the flow of Texas buyers has increased dramatically, making up 11 percent of all buyers in 2011, up from 3 percent in 2005.